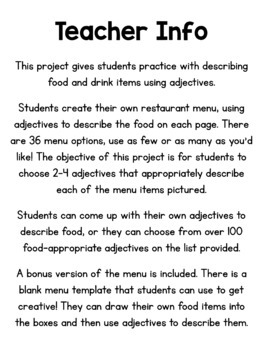 This project gives students practice with describing food and drink items using adjectives. Students create their own restaurant menu, using adjectives to describe the food on each page. There are 36 menu options (two pages each for drinks, breakfast, lunch, dinner, snacks, and desserts), use as few or as many as you’d like! The objective of this project is for students to choose 2-4 adjectives that appropriately describe each of the menu items pictured. 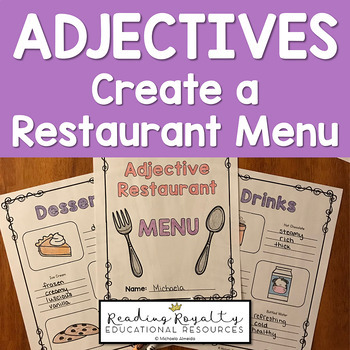 Students can come up with their own adjectives to describe food, or they can choose from over 100 food-appropriate adjectives on the list provided. A bonus version of the menu is included. 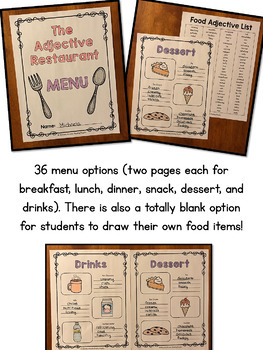 There is a blank menu template that students can use to get creative! They can draw their own food items into the boxes and then use adjectives to describe them.